Oisin Murphy celebrates his Sussex Stakes win on Lightning Spear. Oisin Murphy rewrote the adage ‘better late than never’ as Lightning Spear came of age by winning the Group One Qatar Sussex Stakes at Goodwood. The in-form 22-year-old executed his hold-up tactics to perfection in the £1m race before finishing with a rattling late run to overtake Expert Eye. 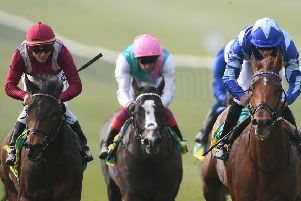 Lighting Spear won a belated Group One race under Oisin Murphy when landing the Sussex Stakes. And the winning jockey’s thumbs up for the cameras, as horse and rider passed the post after this one-mile championship race, showed what the victory meant. This, after all, is a top class miler who has been placed in six Group One races without winning – and was considered an unlucky loser in both Newbury’s Lockinge Stakes and Royal Ascot’s Queen Anne Stakes earlier thisyear. Murphy has endured misfortune at the showcase Glorious Goodwood meeting in the past and picked up a lengthy ban last year when disqualified in a race. Yet this was his second Group One win of the week after Benbatl’s success in Germany on Sunday and his sixth since last October. He is a popular jockey who has grown into the high-profile role as retained rider to Sheikh Fahad’s Qatar Racing and he was delighted to reward the faith that trainer David Simcock has shown in Lightning Spear who appears better than ever at seven years of age. I was nervous today and down at the start I was trying to hide it. “The pace was slow, but he relaxed, and I got a little bit of cover off James Doyle on runner-up Expert Eye,” he said after this redemptive ride. “I never ever get nervous before Group Ones – before the Derby and that I like making fun of the other jockeys – but I was nervous today and down at the start I was trying to hide it. “I am over the moon – what a horse! And what a training performance. He deserves to win a major Group One and it is outstanding. I always reflect on races and I possibly left a Group One behind me this season on this lad. I am lucky I have a good boss and a supportive trainer. “I wanted to ride him as I did because he loves to travel behind heels. I was sure Expert Eye was going to fade away at some stage, bearing in mind this is a mile and his best form is over seven. It will even more to the aforementioned Simcock whose father David passed away on Monday. “That means everything. I’m spoilt and ride him every day, and he’s a gentleman, a very expressive horse, and he leads the string,” said the trainer’s wife Jennie as she fouught back the tears. “He’s a fresh horse, but a lovely one to ride, and he has a very good temperament. My children go into his box and feed him Polos and carrots. I felt today that if he got a gap he would win, because he has such a turn of foot. We always say to Oisin, count to five, count to five, before you make a move. Today Murphy partners the Martyn Meade-trained Wilaminia in the feature Qatar Nassau Stakes, a 10-furlong Group One race for fillies and mares, that is headed by the William Haggas-trained Urban Fox. Skipton-born Haggas, who won last month’s Irish Oaks with Sea Of Class, is enjoying another standout season and Urban Fox – fourth at Royal Ascot – was then a notable winner of the prestigious Pretty Polly Stakes in Ireland. The horse stepping up in trip for the first time on this occasion is Richard Hannon’s 1000 Guineas winner Billesdon Brook. Last seen finishing fourth in the Coronation Stakes at Royal Ascot, she will be without regular partner Sean Levey, who is on the sidelines with a shoulder injury. It’s a chance for former champion apprentice Tom Marquand to land a first win at the highest level. “It’s a horrible situation for Sean but one man’s loss is another’s gain. No doubt it will work the other way at some point in my career,” said the jockey ahead of this race which is part of the Qipco British Champions Series.